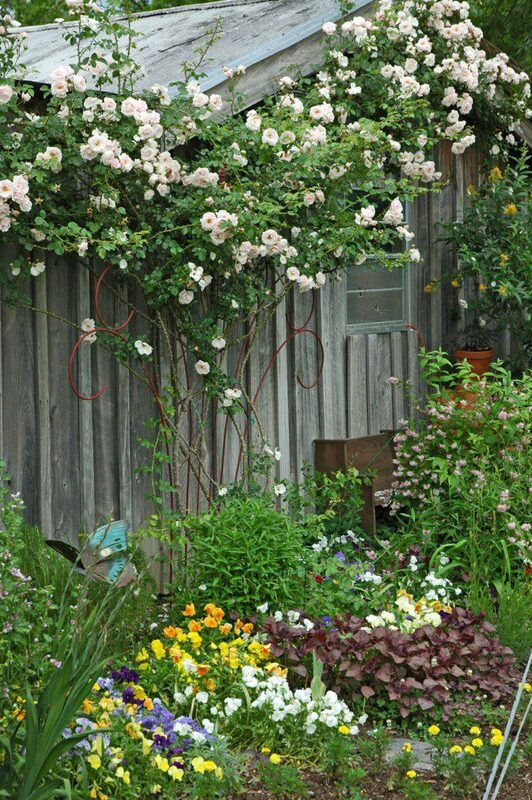 Climbing roses generally have a heavy spring bloom followed by scattered blooms throughout the season. As with most rose types, climbing roses prefer six hours of sunlight daily to flower and perform well. Their roots need loose soil rich in nutrients and mushroom compost is always a welcome amendment. A pH of 5.5-6.5 is preferred so remember to have your soil tested early by the local Extension service to prepare the soil correctly. Roses usually need approximately an inch of water per week. When watering, try to water the roots of the plant and not the foliage. The drier the foliage, the less problems you will encounter during the growing season. Due to Georgia’s humid climate, Blackspot is the most common disease for roses in our area. Roses also tend to be plagued by aphids, thrips, caterpillars and the dreaded Japanese beetle. Because of these pests and fungal tendencies, roses should be maintained on a regular insecticidal and fungicidal schedule. Roses also have a high need for fertilization. Even though climbing roses may not be the ideal plant for the lazy gardener, for many, their beauty overshadows the negative aspects of their high maintenance requirements. Climbing roses make a welcoming statement at any garden entryway and are lovely on arbors or along a fence as a border. They fit well in most garden plans ranging from the casual to the more formal garden setting. Not surprisingly, some of the most popular roses grown in Georgia are also rated highly by scientists at the Georgia Experiment Station located in Griffin, Georgia. Two of these varieties are New Dawn and Don Juan. New Dawn is a light pink and was voted the most popular rose in the world at the 11th World Convention of Rose Societies in 1997. It also scored “Excellent” in most categories by members of the Greater Atlanta Rose Society. Its large flowers have a moderate fragrance and it can climb 10-20 feet in height. It is described as a lower maintenance climbing variety with an abundance of blooms. New Dawn flowers best on old wood so be cautious when pruning. Don Juan was voted “Excellent” overall by members of the Greater Atlanta Rose Society and scored highly in areas such as color, frequency of bloom, fragrance, heat tolerance and disease resistance. Don Juan is dark red with a strong fragrance and like most climbers blooms in flushes throughout the season. If your climbing rose will be near a window or an outdoor sitting area, fragrance may be a priority for your selection. Known for its strong fragrance is Sombreuil. This variety was once known as the Colonial White. It is white or near white with a large, old fashioned bloom form. Sombreuil blooms in flushes throughout the season on old and new wood. It can reach 8-13 feet in height and is more shade tolerant than many other varieties. Another fragrant type climber is the apricot colored Polka. Polka is a lower maintenance rose with a good repeat blooming tendency and an extended bloom season. The height is usually 8-10 feet. For rose lovers that prefer to use fewer chemicals in their gardens, Candy Land and Fourth of July are both exceptionally disease-resistant varieties. Candy Land is a beautiful re-blooming climber that lives up to its name with pink and ivory stripes. It is robust and blooms on new wood so be sure to prune early to promote new growth. It has a slight fragrance, a semi-double bloom shape, and usually grows 10-12 feet in height. With an explosion of red and white stripes, Fourth of July will stand out in any garden setting. It is a vigorous grower with a spicy-sweet apple fragrance. It grows 10-14 feet in height and is a repeat bloomer with semi-double flowers. An interesting twist on the climbing rose is the Zephirine Drouhin. This deep rose-pink variety is virtually thornless. The blooms are fragrant and have been described as the scent of raspberries. Its canes are burgundy colored and easy to train because of their flexibility. Zephirine Drouhin is an antique rose that can grow in partial shade. When in more sunny locations, it produces blooms in great quantities. It is a continual bloomer that reaches 10-12 feet. A multitude of rose information can be found through gardening catalogs, rose societies and the internet. A good source for growing and maintaining roses is the Extension Service publication, http://pubs.caes.uga.edu/caespubs/pubcd/B671/B671.htm. Posted in Home Landscape, Master Gardeners, Perennial, Roses. Bookmark the permalink.